The program director is R. Ariel Gomez, M.D., Director, Child Health Research Center, previous Chief of the Division of Pediatric Nephrology and former Vice President for Research and Graduate studies at the University of Virginia. The program director will report to the Chair of the Department of Pediatrics (James Nataro, MD, Ph.D, MBA) and to the Vice President and Dean of the School of Medicine, David Wilkes, MD, for administrative matters related to the Center. Dr. Gomez is responsible for the scientific coordination, the direction of research emphasis and the overall administration of the Center. He will be assisted in scientific and administrative matters by Maria Luisa Sequeira Lopez, M.D., and Samir El-Dahr M.D., Chair of the Department of Pediatrics at Tulane University. Drs. Sequeira Lopez and El-Dahr will act as associate directors of the Center. In fiscal and managerial matters, Dr. Gomez will be assisted by the Administrator. Drs. Gomez and El-Dahr will have the responsibility for ensuring that heads of departments and deans of their respective Schools of Medicine are informed of all important developments and activities of the Center, particularly as these relate to the time commitments of the various departmental faculties. The administrator will work closely with the staff of the Business Office of the University of Virginia Center for the Health Sciences and implement all administrative decisions and fiscal matters as directed by Dr. Gomez. The Administrator will be supported by funds form the Child Health Research Center, Department of Pediatrics, UVA. The committee consists of Drs. Gomez (Chair), Sequeira Lopez, and El-Dahr. The committee is responsible for advising the Director concerning the research emphasis, the termination of non-productive areas of research or of completed projects, and for decisions as to disbursement of funds. The committee also examines the scientific merit of proposed new research endeavors, including Pilot Projects, and functions as a primary scientific and technical review body. The members of the Executive Committee are highly qualified to carry out primary reviews, serving or having served on NIH, AHA, or VA study sections and advisory and research committees. The internal advisory committee will oversee local activities and facilitate communication within UVA and externally. This committee is responsible for advising the Director and Co-Directors about the research emphasis, the quality of the research being pursued, and the proposed new research endeavors. The internal advisory committee will be made up of the Center Director, the Co-directors and non- Center internal faculty. The selection of Center internal advisors is based on: their expertise in fields related to the projects of the Center investigators, their record of NIH funding and their commitment to research development and education. As the research projects at the institution evolve the composition of the committee may be changed to include members with additional appropriate expertise. 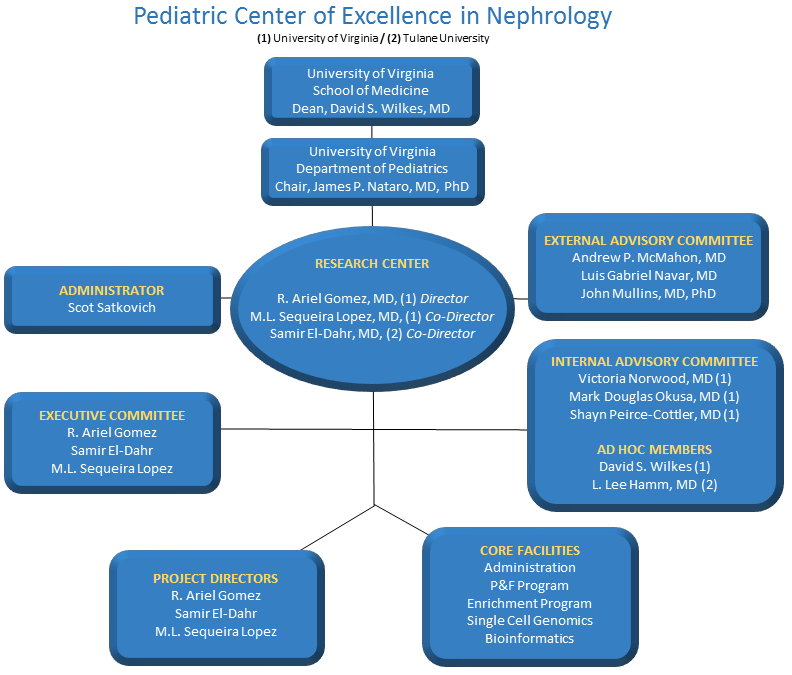 The internal advisory committee is composed by Mark D. Okusa, MD (Director Kidney and Regenerative Medicine Center and Director T32 training program in Adult and Pediatric Nephrology), Victoria Norwood, MD (Division Head, Pediatric Nephrology), Gabriel Navar (Chair of Physiology, Tulane) and Shayn Peirce-Cottler (Biomedical Engineering, UVA). These scientists have well established national and international reputations in kidney and vascular research. In addition, Drs. Wilkes and Hamm respective Deans of the Schools of Medicine at the University of Virginia and Tulane University, will be ad hoc members of this committee. External advisors are scientists with well-established research programs in areas related to the work of the Center. The external advisory committee is composed of Andrew P. McMahon, PhD (Stem Cell Institute, University of Southern California) and John Mullins PhD (Director, BHF Center for Cardiovascular Sciences, Edinburgh Medical School) and will visit with the investigators of the two participating institutions yearly. The Directors and Co-Directors, and other investigators will attend each visit. During their visit, the external consultants will review individual projects in their sphere of expertise, offer suggestions to project investigators, look at the integration of the participating institutions and provide the Director of the Center with a formal written evaluation of specific projects within the Center and of the administrative management of the Center. The advice of these external consultants is an important source of critical input that is invaluable to the Director and to the project investigators. The external consultants will also make recommendations regarding the suitability and continuation of pilot projects. In keeping with the educational mission of the Center, consultants will be invited to give a seminar in their respective research areas and interact with pediatric residents and fellows and researchers in the institution. The Consultants will be asked to submit a written report evaluating the Center’s performance. These evaluations will be part of our annual progress report submitted to NIH. The members of the External and Internal Advisory Committee and the Executive Committee serve as the Pilot and Feasibility Program Oversight Committee. Applications for P&F projects will be solicited as described in the Pilot and feasibility Program section. The External and Internal Advisory Committee and the Executive Committee will review, evaluate and approve the P&F project applications. Details about the progress/publications under the aegis of the P&F program can be found in our website: http://research.med.virginia.edu/pcen/ and in the respective section of this application. The Enrichment program committee is composed of the Executive Committee with the Program Director as Chair. The committee will select recipients of summer research and meeting travel support, select topics and speakers for the various programs and organize local symposia and the annual review meeting. The committee will meet three times a year to ensure oversight of the proposed program and future programs. The enrichment program is described in a separate section of this proposal.